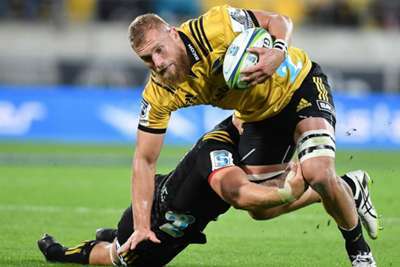 Hurricanes captain Brad Shields has made a formal request to be released from his New Zealand Rugby contract so he can play for England against South Africa in June. The New Zealand-born loose forward qualifies to play for Eddie Jones' side through his parents and is expected to be called up to face the Springboks in a three-match series which falls during the Test window. New Zealand Rugby chief executive Stew Tew confirmed that Shields, who will join Wasps at the end of the Super Rugby season, has officially asked to be allowed to join up for international duty. "It's quite a work in progress," Tew is quoted as saying in the New Zealand Herald. "We've only just this morning got a formal request to consider releasing Brad. "He's contracted to New Zealand until the end of Super Rugby and so the World Rugby regulations don't apply per se because he's committed himself to New Zealand, but he is a long-standing and loyal servant of the game and has put a request in. "We're looking at that and are considering the ramifications of releasing him to England in the middle of a competition he is committed to. We haven't made a final decision yet. "We'd treat any request from our employees on its merits and take into account all sorts of factors. "There's no point in not acknowledging that Brad has been a very, very good servant of the game for a long period of time. If he had been picked for the All Blacks we wouldn't be having this conversation but he hasn't made that cut and is now taking a different direction." Tew said a decision on Shields' request will be made in the near future. He added: "We're not going to muck around. There's no point in taking weeks when he and England need a decision faster than that."